Professor Kallert has been active in the field of mental health services research for many years. He was co-ordinator of the EC-funded research project, European evaluation of coercion in psychiatry and harmonisation of best clinical practice (EUNOMIA). He has published 6 books, more than 35 chapters in books, and more than 125 articles in peer-reviewed journals. He has received the Hermann-Simon-Prize for Social Psychiatry, and the Hans-Heimann-Prize of the German Society of Psychiatry, Psychotherapy and Neurosciences. He is an Honorary Member of the World Psychiatric Association. Dr. Mezzich was Chair of the World Psychiatric Association (WPA) Section on Classification and Diagnostic Assessment, and a member of the ICD-10 Mental Disorders Workgroup and the DSM-IV Task Force. 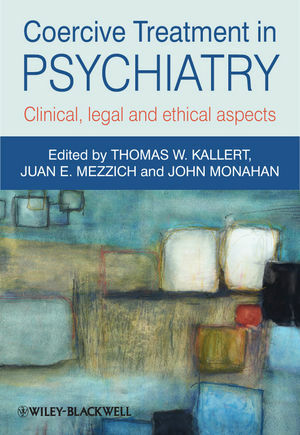 He has authored over 200 scientific journal articles and book chapters and 25 books and monographs primarily on psychiatric diagnosis and epidemiology from clinical, philosophical, statistical, and cultural perspectives and more recently on person-centered psychiatry and medicine. He has received six Honorary Doctorates from universities in the Americas and Europe as well as the Simon Bolivar Award of the American Psychiatric Association, the Medal for Extraordinary Merit of the Medical Council of Peru, and the Linneaus Medal of Uppsala University in Sweden. He is President of the InternationalNetwork for Person-centered Medicine. Professor Monahan is well known internationally for his numerous publications and presentations in mental health law, for his leadership of the MacArthur Research Network on Violence, Coercion and Competence and of the current MacArthur Research Network on Mandated Treatment in the Community, and for his generous support and encouragement of scholars in coercion and in all areas of mental health law.